When it comes to getting your toddler to eat healthy food yet something that looks more like what all other children buy from the supermarket &amp; eat...well "healthy carrot muffins", there couldn't be a better answer at least for the moment when i don't have too much time to cook , for kids who are naughtier &amp; families who are naughtier.... what could be a better idea than this...?? The most important part was that each yummy cupcake contains about 1/2 a serving of veggies,without the frosting, plus healthy enough for your child to have them every day. It took off really cool &amp; everybody ate the cupcakes as if they had never tasted something like this actually they had never tasted something like this...!! 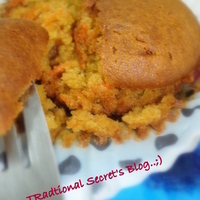 As the carrot cup cakes baked in my oven the sweet aroma of carrots filled the house, the great thing was that it took only about 20-25 mins to get them all done...hmmmm...smells heavenly...!! well try it, I'm sure you will have the same opinion on this...!! 2 cups white whole-wheat flour. 1/2 cup vegetable oil( i used olive oil). Preheat oven to 350 degrees F. Line the muffin cups/moulds with paper liners. Combine flour, baking soda, cinnamon, baking powder, and salt in a medium bowl; whisk until blended. In a separate bowl, beat eggs and sugar with a wooden spoon. Add oil and orange juice, then combine with flour mixture. Fold in carrots. Pour the batter from a spout into prepared cupcake/muffin liners or moulds. Bake at 350 degrees F for 18 to 22 minutes, or until a toothpick inserted into center comes out clean. Tasted great! Just added some chocolate chips for my sweet tooth.